If you are interested in some of Sandra's personal thoughts about healing, and in reading her personal story of emotional healing, they are at the bottom of this page. Discover how to . . .
Change your body's cells from Protect Mode to Growth Mode. In growth mode, your body's cells can protect you from or heal almost anything. The Healing Codes is an energetic healing method that is based on self treatment. It is easy to learn and simple to do. It takes just a few minutes a day. Sandra Lee is a Certified Healing Codes Practitioner. If you purchase The Healing Codes package from the company, Sandra can be your Coach. She can also do Healing Codes Coaching with you on an individual basis. Click here to see the products that The Healing Codes company offers, and to hear people's stories. The Emotion Code is a simple technique for identifying and clearing Blocked Emotion. When intense things happen and you do not fully experience and express your emotions, they can become blocked. You then have a ball of blocked emotional energy in your field. This affects how you feel about life and the things that you want to accomplish. Do you have Blocked Emotions? When you don't know what you want, blocked emotions are contributing to confusion. When you are not taking actions, blocked emotions are contributing to stuckness. When you struggle with your spouse, children, parents, coworkers, etc. blocked emotions are hampering you. It's blocked emotions when you feel either unloved or unable to express love! When you are stressed, can you feel tightness in your body? Does it make sense that blocked emotions can manifest as physical symptoms and illness? Clearing blocked emotions impacts physical and emotional health, relationships, and success. If you want to learn to do The Emotion Code for yourself, it is easy to learn and simple to do. Dr. Bradley Nelson's book is easy to find online. The Emotion Code is the powerful and effective central heart of The Body Code system. The added capabilities of the wider Body Code system allow for a deeper level of healing. Sandra is a certified practitioner of The Emotion Code and The Body Code. When working with you as a client, I may use any of the modalities for emotional and spiritual healing at my disposal, including The Healing Codes, and The Emotion Code/The Body Code. Intuition provides both guidance and information, which I then bring forward into our conversation. Please contact me if you are interested in scheduling a session. Send me an email at sandra@MiracleInspirations.com. 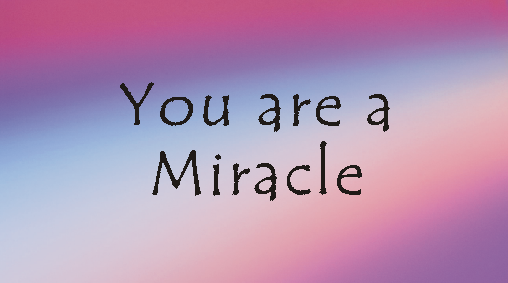 The truth is that you already ARE a Miracle. Everyone is. But we don't usually recognize this as a fact in our daily lives. How do you get out of your own way, and allow yourself to experience the Miracle that you are, each and every day? How can you offer your natural gifts to the world, through every word and every action? Would it be an amazing and wonderful miracle if you were living the life of your dreams doing what you love to do? As a practitioner of emotional and spiritual healing modalities, Sandra inspires you to wake up to the Miracle that you are. Heal yourself of wounds and traumas from the past, freeing you to fulfill your potential and contribute to the world. You CAN have a fabulous life, abundant and satisfying, doing what you love. Experience the peace that comes with living your natural gifts, free from inner struggle and conflict. Have you set goals, then failed to make them happen? Have you taken personal development programs and made big promises to yourself? A major shortcoming of these programs and of goal setting is that they operate on the conscious level. It is usually sub-conscious or unconscious resistance that keeps you stuck in all areas of life - business, health, relationship, finances, and more. Emotional and spiritual techniques focus on healing these unconscious blocks. At Miracle Inspirations, our goal is assisting you in discovering the truth of who you are, clearing up your blocks, and supporting you in being effective and fulfilled in all areas of your life. If you are interested in learning more about your gifts and how you are designed to contribute, a Human Design reading may be supportive. Visit the Human Design page. I invite you to subscribe to my newsletter and download the free gifts that are available only to subscribers, including the Special Report Do You Have the Life You Want? Who's Really Running the Show? It is a pleasure serving you. For over a decade, I sought to heal the emotional issues that weighed me down. I read books, took personal growth workshops galore, and worked with counselors and hypnotherapists. My 'stuff' was always still there. Affirmations and positive intentions got me nothing but more frustration, because my deeply seated fears were running the show. With everything I had learned, I felt like I SHOULD have things all figured out, and that my life should be perfect. But it wasn't happening. When I left the seminars, all the motivation and excitement evaporated. Leaving me with nothing but feelings of failure. One reason why workshops and therapy didn't produce lasting results for me is that they work pretty exclusively on a conscious level. The things that were blocking me were in places where I never looked. I didn't know that I didn't know there was a problem. In workshops with Landmark Education Corporation, I learned about the concept of the 'Story' that each person has that is the context within which everything else in life happens. My Story was "I'm bad." As far as I was concerned, on an emotional level, that absolutely fit! "I'm bad" was underneath everything I felt, thought, said, and did. That was me. My years of healing efforts had definitely made a difference. Despite my learning how to manage the Story, underneath everything else it was always still there. Whenever something upset me, I could see that "I'm bad" was at the bottom of the upset. And I would consciously tell myself, "That's not true." Then I discovered techniques that specifically focus on emotional and spiritual healing. First was The Healing Codes. Two weeks into doing the Codes, I was driving to my parents' house, which takes an hour. Suddenly I realized that I was neither speeding nor wanting to go faster. I wasn't making mental to-do lists or problem solving. I was just enjoying the ride. This caught my attention, because it rarely happens. Shortly after that, I was writing an e-mail to a friend. I said in my mind, "I'm bad." And my mind said back to me, "That's not true." Now that had never happened before. It was not a conscious thought process. For several minutes, I tested this, with the same result. Eventually, my mind was laughing at me, saying, "Give it up, it's not true!" My mind would no longer allow me to repeat the Story. A while later, I had a deeply healing experience with The Healing Codes where I really forgave myself. Over the years, I had consciously forgiven myself thousands of times. But this time the forgiveness actually got through. Suddenly, for the first time, I consciously experienced myself as being loved. I actually allowed into my deep inner self the love that had always been given to me, but that I had not allowed myself to receive. On a fundamental level, through doing the Healing Codes I had healed deep emotional wounds. The unconscious blocks to my happiness were clearing. Years later, I discovered The Emotion Code and The Body Code, and other wonderful emotional and spiritual healing modalities. When working with clients, I intuitively work with whatever techniques will provide support. I am available for private sessions, if you are interested. Please contact me if you would like to schedule a session. Send me an email at sandra@MiracleInspirations.com.